The gender pay gap is real, and it’s worse for older workers than younger ones. That’s the message behind a set of figures that map the average differences between what men and women earn throughout their careers. There is an enormous gender wage gap in the U.S. for workers at every stage in their careers. The problem gets worse as people get older, increasing from $2,000 when people start working to $16,000 when they get ready to retire. The wage gap accelerates for workers in their 30s and 40s, suggesting that choices around having children play a role in widening gender pay disparities. Inc. originally gathered the data from IPUMS USA, a research organization that collects and preserves U.S. Census data for the public. The underlying data for our visual comes from the 2017 American Community Survey, which is an annual survey that the Census performs between the decennial survey. These figures provide a deeper look at gender pay disparities than what we previously published, and they contain lots of insights about American workers. First of all, a substantial gap exists for people no matter how old they are. It’s there when people first join the workforce, and it persists until retirement. The fact is that women make less than men from the very start. 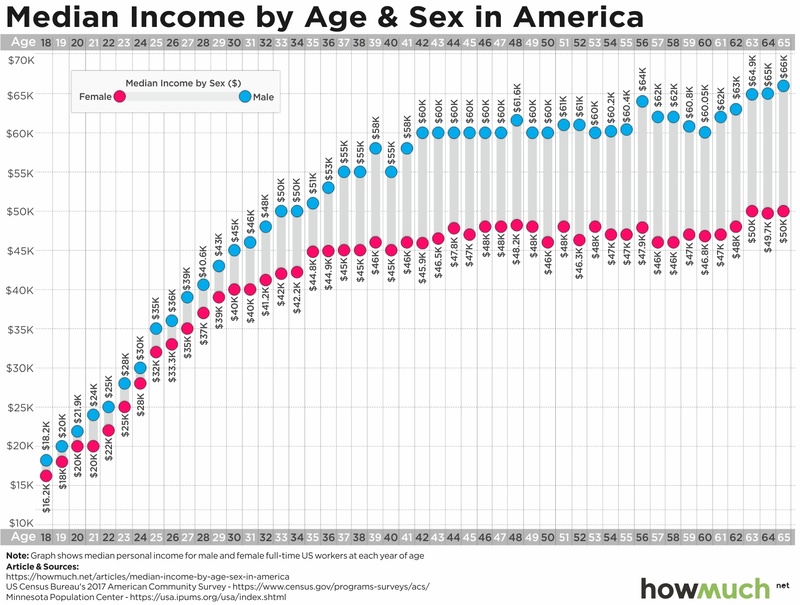 The initial difference for 18-year-old men and women is $2,000. That’s a lot of money to teenagers, and it’s a gap of more than 10%. To put that another way, a woman would have to work an additional 5.7 weeks each year just to take home as much money as men. The gap starts out enormous, but it stays relatively stable in the earliest decades of a worker’s career. As both men and women gain more experience and advance in their careers, they both earn more money than before. Expressed as a percentage of income, it stays around 10 or 11% even as it grows in overall terms from $2,000 to $5,000 by age 30. And then the wage gap explodes as workers advance into their 30s and start to settle down in their careers. Just as Americans get married, buy homes and start families, men start earning even more than women. The gap reaches its height at $16,100 at age 56, which comes out to a 25% premium. Lots of people deny the gender pay gap exists. And even if it does exist, they argue it’s entirely explainable by choices related to career paths, or perhaps parenting preferences are to blame. After all, our visualization indicates how the gap expands just when people start families. But that’s only looking at part of the picture. There’s a deeper dynamic going on than differences in parenting choices and career outcomes. The proof is that women never catch back up to men, even in their late 50s and early 60s. And more to the point, the wage gap exists long before most workers have children in the first place. The wage gap should be called exactly what these numbers suggest. It’s discrimination.